The Internet of Things (IoT) isn’t just one technology – it’s many technologies working together to increase the automation, safety, and efficiency of everyday tasks. In smart cities, for example, the IoT involves a mix of technologies that create a greener, more connected urban environment. That’s the case in Columbus, where NXP has partnered with the US Department of Transportation (US DoT) as part of the Smart City Initiative. Automotive (V2X) technology is enhancing public and private transportation, while smartcard IC technology is creating a single credential for multi-modal transport, and long-range RFID technology is easing traffic congestion and helping prevent accidents. Smart homes, which are very much a part of smart cities, typically use a different combination of technologies to enable IoT features. Familiar wireless technologies, like Wi-Fi, Bluetooth, and NFC, combine with sensors and special light fixtures, to create smart homes that are more efficient, more automated, and more programmable. IoT applications for the home have been available for a few years now, and promise to improve life in lots of ways, but, so far, smart-home solutions can be hard to deploy. Often the technology interfaces are too complicated, and things don’t work together quite as seamlessly as expected. Technology developers are keenly aware of the need for simplicity and convenience in smart-home applications. The NFC Forum in particular, has formed an IoT Special Interest Group (SIG) to investigate how NFC makes it easier to connect, commission, and control IoT devices in the home. The figure below gives an overview of what that means. NFC lets you pair devices that use different communications technologies, so you can initiate a Bluetooth or Wi-Fi transaction with just a tap. Join a Wi-Fi network without having to enter settings or complex passcodes, or add a new light fixture to your network without keying in a product ID or serial number. NFC is especially helpful when working with IoT devices that don’t have a user interface, such as light bulbs, sensors, small appliances, electrical outlets, and so on. NFC makes it easier to install your setup, log data, and maintain your network. In most cases, your smartphone becomes the user interface for the smart-home network, making it possible to interact with IoT devices. Tap your phone to your water meter, to monitor usage or view your account, or run diagnostics on your Internet-connected TV, so you can resolve a problem, access warranty information, or request a service call. You can even use your phone or tablet to program appliances that aren’t connected to Wi-Fi, like your microwave, for a new level of programmability. NFC gives you greater control over settings and access privileges, so there’s a higher degree of flexibility with a higher degree of security. You can set your washing machine to start early in the morning, or program your preferred settings for lighting, temperature, and entertainment, so your living room is just the way you like it, or temporarily disable your alarm to let guests in. 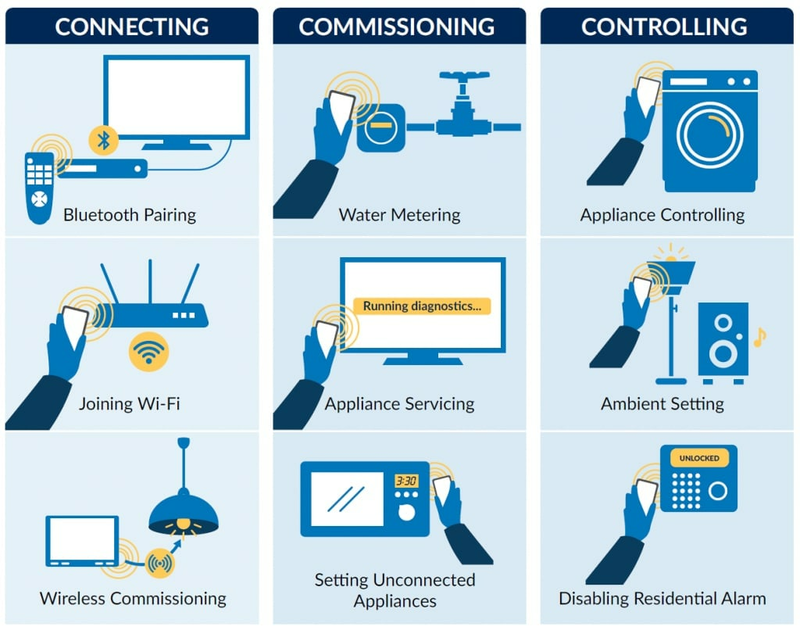 With support of NXP’s NFC experts, the NFC Forum has published a short, easy-to-read white paper that summarizes use cases for connecting, commissioning, and controlling with NFC at home. You can download a copy of the white paper here. How has your experience been with connecting, commissioning, and controlling IoT devices?